The Terrahawks Cyber Pages, main page. It is Earth year 2020. Alien spaceships approach the planet Mars. The NASA Expedition HQ is spectacularly destroyed. Androids have journeyed from the planet Guk, in the galaxy of Alpha Centauri. Their witch-like commander, Zelda, sets up her base on Mars and lays plans for the invasion of Earth... and the destruction of the human race. 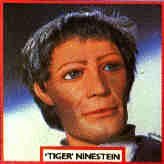 Alerted by the first Alien Attack in 2017, the UN High Command appoint Doctor 'Tiger' Ninestein to devise and establish an elite international fighting force to defend the world against the unknown aggressors. This small, dedicated team is called TERRAHAWKS, and comprises Doctor 'Tiger' Ninestein, Captain Mary Falconer, Captain Kate Kestrel, Lieutenant Hiro, Lieutenant Hawkeye, Sergeant Major Zero, Space Sergeant 101 and...the Zeroids. From their secret base somewhere in South America they develop their sophisticated weaponry and prepare for the battles to come. Can TERRAHAWKS defeat Zelda and save the Earth from destruction? NEW DVD & VHS ISSUE - click on 'What's new' below. Meet Zelda's Monsters & Alien Friends ! The Alien Craft, Cubes and Zeroids. Looking for TERRAHAWKS memorabilia? Try Ebay - click on the link below. Visit my UFO Memorabilia Collection Pages. The Space:1999 Cyber Museum - not to be missed ! The Space:1999 Cybrary - not to be missed ! T 'N' T Hobbies - Memorabilia and excellent hand-crafted models & dioramas! Marc Martin's UFO Pages - not to be missed ! Back to fab1.net main start page! Any comment's or additional information ?